Abt 1182 - 1204 (~ 22 years) Has more than 100 ancestors but no descendants in this family tree. 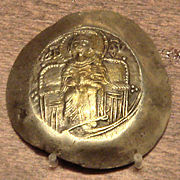 The young Alexios was imprisoned in 1195 when Alexios III overthrew Isaac II in a coup. In 1201, two Pisan merchants were employed to smuggle Alexius out of Constantinople to the Holy Roman Empire , where he took refuge with his brother-in-law Philip of Swabia , King of Germany . While there he met with Marquis Boniface of Montferrat , Philip's cousin, who had been chosen to lead the Fourth Crusade , but had temporarily left the Crusade during the siege of Zara to visit Philip. Boniface and Alexios discussed diverting the Crusade to Constantinople so that Alexios could be restored to his father's throne; in return, Alexios would give them 10,000 Byzantine soldiers to help fight in the Crusade, maintain 500 knights in the Holy Land, the service of the Byzantine navy (20 ships) in transporting the Crusader army to Egypt , as well as money to pay off the Crusaders' debt to the Republic of Venice with 200,000 silver marks. Additionally, he promised to bring the Greek Orthodox Church under the authority of the pope. Alexios accompanied Boniface back to the Crusader fleet, which had moved on to Corcyra , and the Venetians were in favour of the plan when they learned of it. In 1202 the fleet arrived at Constantinople. Alexios was paraded outside the walls, but the citizens were apathetic, as Alexios III, though a usurper and illegitimate in the eyes of the westerners, was an acceptable emperor for the Byzantine citizens. On July 18 , 1203 the Crusaders launched an assault on the city, and Alexios III immediately fled into Thrace . The next morning the Crusaders were surprised to find that the citizens had released Isaac II from prison and proclaimed him emperor, despite the fact that he had been blinded to make him ineligible to rule. The Crusaders could not accept this, and forced Isaac II to proclaim his son Alexios IV co-emperor on August 1 . In December 1203 violence exploded between the Constantinopolitans and the Crusaders. Enraged mobs seized and brutally murdered any foreigner they could lay hands upon, and the Crusaders felt that Alexios had not fulfilled his promises to them. Alexios refused their demands, and is quoted as saying, "I will not do any more than I have done." While relations with the Crusaders were deteriorating, Alexios had become deeply unpopular with the Greek citizenry, and with his own father. Blinded and nearly powerless, Isaac II resented having to share the throne with his son; he spread rumors of Alexios' supposed sexual perversity, alleging he kept company with "depraved men". The chronicler Nicetas Choniates dismissed Alexios as "childish" and criticized his familiarity with the Crusaders and his lavish lifestyle. At the beginning of January 1204, Alexios IV retaliates against the Crusaders by setting fire to 17 ships and sending it against the Venetian fleet, but the attempt fails. At the end of January 1204, the populace of Constantinople rebelled and tried to proclaim a rival emperor in Hagia Sophia . Alexios IV attempted to reach a reconciliation with the Crusaders, entrusting the anti-western courtier Alexios Doukas Murzuphlus with a mission to gain Crusader support. However, Alexios Doukas imprisoned both Alexios IV and his father on the night of January 27-28 1204. Isaac II died soon afterwards, possibly of old age or from poison, and Alexios IV was strangled on February 8 . 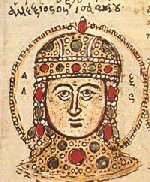 Alexios Doukas was proclaimed emperor as Alexios V. During Alexios IV's brief reign, the empire lost its territories along the Black Sea coast to the Empire of Trebizond .